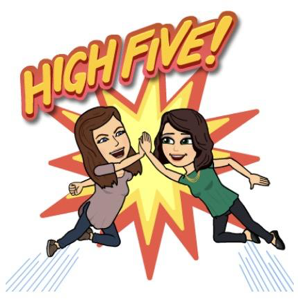 We are Melissa White and Lacey Snyder, an instructional coach and teacher librarian, respectively, from Iowa who are passionate about approaching our jobs in a positive way. Last school year we created (sort of on accident) Let’s Talk About Teaching, a video series that highlights teaching and learning with the goal of encouraging teachers to try #OneSmallThing in their classroom. Now we want to share #OneSmallThing with you. Melissa: I am in my 18th year in education, currently an instructional coach and a former English teacher and elementary librarian. I love inspiring creativity, ideas and questions. I get through my days with a lot of positivity and coffee. Lacey: I am in my third year teaching. Being a teacher librarian is the best job ever because I get to share my passion for books with kiddos and watch them fall in love with reading. I’m all about positive vibes, awesome books (duh), hangin’ out with my fur babies and dark chocolate mochas. As an instructional coach and teacher librarian, we are able to view the work of teachers and students through a unique lens and purpose. Part of our job is to support teachers with resources and ideas. We are able to think, learn and share about teaching and learning in ways that busy teachers don’t always have time for. But we wanted to do more than share resources – we wanted to curate learning opportunities for teachers. That’s why this year, we teamed up with Teacher2Teacher to invite educators to learn and grow their practice by creating and sharing their #OneSmallThing: an actionable goal educators can make on their own or with colleagues to kick off the year. This idea is based on the simple idea that big impact comes from small changes, one at a time. Our very first #OneSmallThing was finding each other and sharing our daily ups and downs and struggles and triumphs. We’ve learned that sharing our teaching with someone else will make us better, stronger and happier. 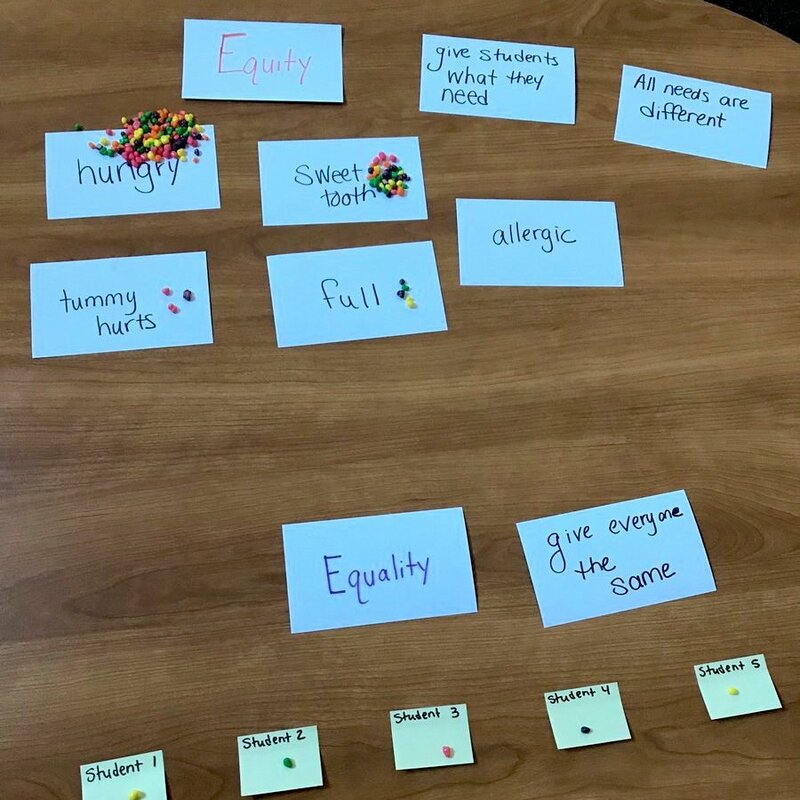 Teachers who find the time to share intellectual and emotional space with other educators will see and feel the benefits in all parts of their teaching day. 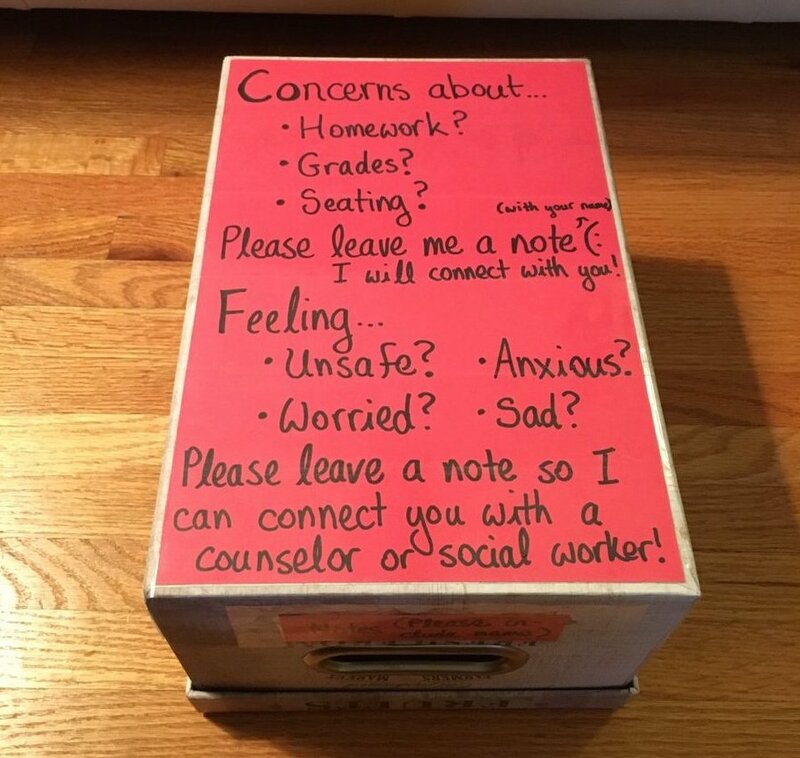 Teaching is hard and complicated and wonderful and rewarding – and in our small space, we have discovered that we are better when all of these feelings are shared. Here’s the thing about collaboration: We all need it. Teachers must create and make time to share in this work together. Sometimes it’s bouncing ideas off one another in our office or the halls. Other times it is texting or snapping at night. Sometimes it is spontaneous, like during a workout after school. Sometimes a thread of ideas will stick around in our space for weeks until we are ready to tackle it. The point is we spend time talking about feelings and funnies and stuff and things. Building this space for yourself every day is just one example of #OneSmallThing you might do to grow this year. Last school year, we were trying to figure out an easy way to show the teachers in our building how to update their iPads. 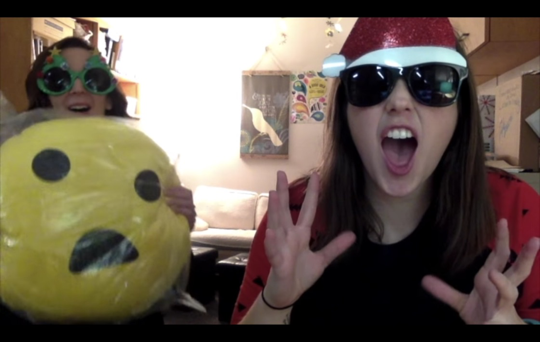 Rather than sending an email, we thought people would respond better to a video. We called it Let’s Talk about Tech and sent it out! Looking back, it was a little long and scripted (click here if you want to lose eight minutes of your life forever), but it turns out teachers were kind of into it! We realized we really like to talk – and that people like to listen. We also wanted to talk about more than just technology (technology is not always the star). So we changed the name to Let’s Talk about Teaching, and we talk about all things surrounding teaching and learning! We record the videos in the small time blocks between classes, during lunch and after school. We edit them in the late hours and early mornings. And every second is worth it! 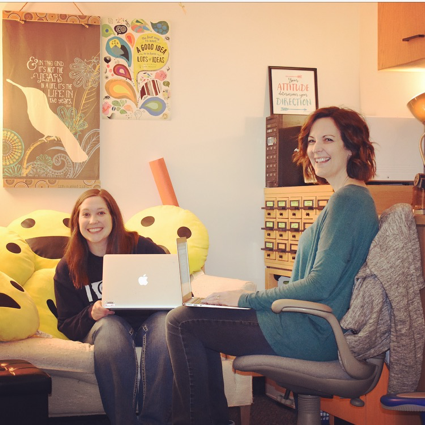 With each episode we grow as educators, and our biggest hope is that we have created a learning space for others. Since our first video, we have recorded ten episodes, one teacher feature and three breaking news episodes (we have a lot of news). This video newsletter was yet another #OneSmallThing for us, and it expanded to our entire school community and beyond. When thinking of what a #OneSmallThing could be, we look for ideas that will inspire teachers to try something new in their classrooms. 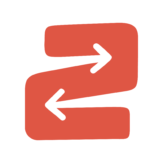 We want to build a community of positive learning by changing how busy teachers learn and grow: together. We believe that kids and teachers need to have a space where they feel comfortable to be creative, try new things and reflect. That can be pretty scary, but it gets easier if you find the person that you can go to for all of it: the celebrations, the tears, the “OH NO” moments, the laughs – and everything in between. In our work, we connect with others through conferences, Twitter, Facebook and Instagram. We have collected colleagues from these spaces who motivate and inspire us. We grow stronger from these connections, and that makes us better teachers. Ultimately, that’s what is best for kids. We want to share our space and energy (and awesomeness) with teachers to inspire them to try their own #OneSmallThing. We hope teachers learn the power of trying something new (even if it is scary) and staying motivated by sharing that #OneSmallThing with a colleague in their building, on social media or even with us! No matter where the future takes us, the two of us are colleagues for life who will share space to talk about our teaching and learning. We encourage you to find your inspiration, something creative that fills you up, a reflective space, your people and your #OneSmallThing. Don’t know where to start? 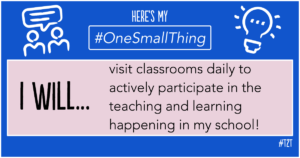 Check out this #OneSmallThing generator to get inspired by other educators’ examples, then create and share your very own customized #OneSmallThing graphic. You can share it on social media, print and hang it in your classroom and school, or even share it with us! 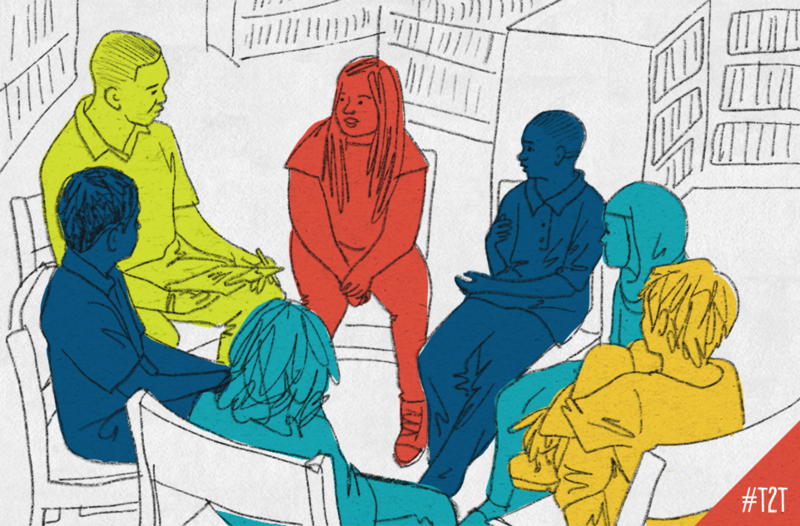 You can even get your whole school community involved with this #OneSmallThing toolkit. We’d love to see what small thing you’re excited to try out to grow your practice – and yourself! – to jump-start the year ahead. Ready, set, GO! 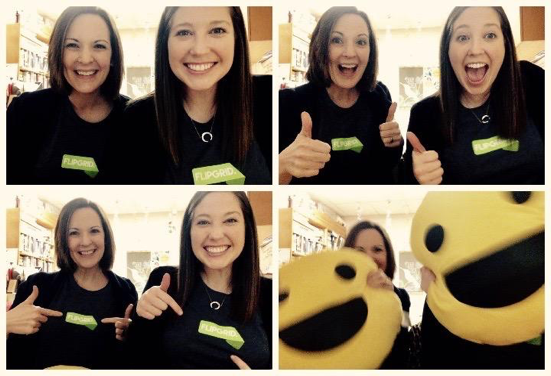 Follow Lacey and Melissa on Twitter at @letstalkteach.